This is a beautiful fossil shark tooth. It is an extremely large Carcharocles megalodon (Extinct Giant White Shark) tooth from the Miocene Deposits of Morocco. This specimen is quite large and impressive - FIVE AND A QUARTER inches long! The tooth is wonderfully preserved and displays beautifully. The fossil is extremely robust and finely detailed. The enamel is a beautiful peach color, and the serrations and tip are intact and razor sharp. 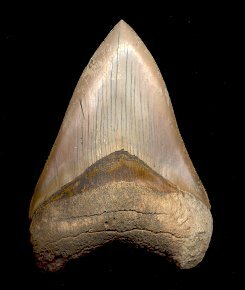 Not only is this a very large, colorful Meg tooth, there is NO RESTORATION to the fossil! This is a fabulous Moroccan Meg tooth that displays beautifully on both sides.